For much of the operational life of the Romulan Warbird, Starfleet knew absolutely nothing about it. It was not until 2364 that any Starfleet personnel even saw a Warbird first hand. Prior to this only the haziest of intelligence reports existed concerning any class of Romulan vessel. An encounter between a Romulan Warbird and the USS Enterprise-D at the Romulan neutral zone in that year provided Starfleet with its first good information on the Warbird. The first impressions were not comforting ones, the Romulan vessel was almost twice the size of the Enterprise-D itself then the largest and most powerful vessel in Starfleet. The Warbirds' cloaking device was highly effective against the latest Federation sensors, and the great size of the vessel indicated that it outgunned Starfleet's finest by a considerable margin. Over the next few years Starfleet intelligence devoted considerable resources to the new Romulan threat, and the defection of Admiral Jarok promised to be a famous intelligence coup, but disappointingly it proved to be a disinformation ploy by the Romulans. The return of former Ensign Stefan DeSeve, who had previously defected to the Romulan Empire in 2349, generated a good deal of background information on the Romulan military structure and the general capability of their fleet, but provided little specific detail. The Federations greatest victory in the intelligence war occurred shortly after the return of DeSeve when Vice Proconsul M'ret and two of his aides defected. M'ret, who had served on several defense related councils in the Romulan Senate, was able to provide a great deal of detailed information on the capabilities of the Warbird, among other things. Romulan D'deridex Class Warbirds engaging enemy vessels by firing their main disruptors. The appearance of overwhelming size and strength was to prove somewhat deceptive. Although the disruptor armament is impressive, the technology behind it is behind that of the Federation phaser array. The disruptors have a high power but relatively low rate of fire and somewhat limited range. The twelve torpedo tubes are capable of firing only one torpedo each at a time, and have a combined rate of fire some 85% that of the two tubes of a Galaxy class. The Warbird is also somewhat slower and a great deal less maneuverable than a Galaxy class starspecs. The Federation has also made considerable progress in defeating the Romulan cloaking technology in the past few years, the deployment of wide area tachyon nets along the border together with advanced sensor posts have made penetrating Federation space a rather chancy proposition for the Warbird. Another impressive detail on the Romulan D'deridex is it's two, three deck high shuttlebays. With these impressive dual shuttlebays, they let the D'deridex carry a good sized compliment of shuttles and fighters, which can turn the D'deridex into a launching pad for a small fleet of fighters. To keep it efficient, as Romulan always do, these shuttlebays were placed on the under-belly of the specs, just under the neck. However, the Romulan Warbird remains an impressive design which is capable of quickly defeating all but the most advanced and powerful Federation and Klingon vessels. Starfleet continues to treat these behemoths with a considerable degree of respect. The D’Deridex Class like all Romulan ships of the modern era use an artificial quantum singularity to power the ship. At speed greater warp 6 the warp filed of a D’Deridex Class can be detected through the ships active cloaking device. 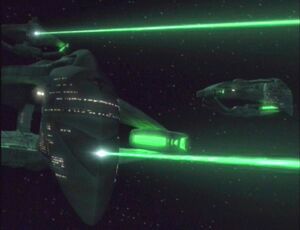 The D’Deridex class is equipped with at least one tractor beam. This is mounted on the ventral surface of the lower neck aft just aft of the forward hull and is used to maneuver shuttles and or other objects into the docking bays.